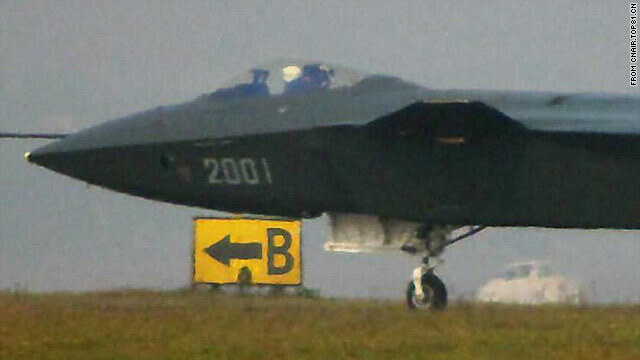 Grainy image shows China's new stealth fighter jet, known as the J-20, undergoing runway tests. Beijing (CNN) -- A jet fighter points up to the sky, a row of missiles line a walkway and revolutionary films are on constant rotation at China's aviation museum on the outskirts of the capital, Beijing. Occupying pride of place here: the bomber which deployed China's first nuclear bomb. These are the relics of the Asian giant's military past, but it is also a nod to the might worthy of an emerging superpower. A red jet fighter catches my eye amid the Chairman Mao paintings: it is the MiG-15 credited with China's first victory in the sky, shooting down an enemy aircraft over the skies of Korea in 1950. Now, the world's attention is focused on a new Chinese jet fighter, the J-20. Pictures of the radar-evading stealth plane have appeared in recent days, carrying out runway tests. It is the latest addition to China's growing military arsenal. Is China matching U.S. jet prowess? The photos of the fighter come on the eve of a visit to Beijing by U.S. Defense Secretary Robert Gates that begins on Sunday. It is yet another reminder that China is developing the military might to go along with its economic strength, though Pentagon officials insist it does not mean China has matched American air capabilities. At a briefing on Thursday, Chinese foreign ministry spokesman Hong Lei declined to comment on reports that China was testing the jet. "China insists on a path of peaceful development," he said. "We have adopted a national defense policy that is defensive in nature and do not threaten any other countries. China has been an important force in maintaining regional and global peace." Some analysts see an emerging power-play between the U.S. and China for influence in the Pacific and resource-rich Central Asia. To some, it is shaping up as a 21st century "Great Game," a modern replay of the 19th century struggle for empire between the giants of the time, Great Britain and Russia. "There's a dangerous dynamic emerging here," says Russ Moses, a long-time China analyst. "China sees itself being encircled and its newfound power being contained in some way." China really doesn't know what to do with its power. It has a lot of newfound capability but it hasn't decided what it wants to do or where to project its power. China officially spent about $80 billion on its defense in 2010 -- but unofficially others put it much higher. The U.S. Defense Department estimates China's military spending at closer to $150 billion. China is certainly modernizing and upgrading its hardware. As well as the new aircraft, it is expanding its navy's capabilities, re-fitting older Russian aircraft carriers as well as building new ones. Moses says there is intense competition within the Chinese defense force for power and money. Each arm of the military wants to establish its own supremacy and outbid the other. This comes at a time when China is preparing for a leadership change with President Hu Jintao to begin his exit next year. His successor is widely believed to be Vice-President Xi Jinping. All of this makes the U.S., and regional powers like South Korea and Japan, wary. Moses says their concerns may be premature. "China really doesn't know what to do with its power. It has a lot of newfound capability but it hasn't decided what it wants to do or where to project its power." Still, walking around the discarded jet fighters and bombers, the missiles and relics of war at the aviation museum, it is clear that military might was essential to China's past as it will likely be to its future. There are flashpoints: China's support for North Korea, the status of Taiwan, disputed islands with Japan. With Gates in Beijing over the weekend and China's President Hu Jintao preparing for his trip to Washington for talks with President Obama in late January, military matters are likely to be front and center. "China is a rising power, and it is determined to challenge the American position globally," said China military scholar and author Richard Fisher.